The thirteenth Walt Disney film Alice in Wonderland was released on July 26, 1951. The film differs slightly from the novel and features the voices of Kathryn Beaumont (who later voiced Wendy Darling in the 1953 Disney film Peter Pan) as Alice, and Ed Wynn as the Mad Hatter. 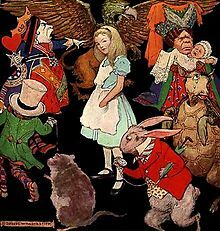 The theme song, “Alice in Wonderland”, has since become a jazz standard. On the bank of a tranquil river, a little girl named Alice grows bored and starts daydreaming, that she would prefer to live in a nonsensical dreamland called Wonderland. She then spots a waistcoat-wearing White Rabbit passing by, and pursues him into a rabbit hole and falls into a labyrinth before seeing the rabbit disappear through a tiny door. Through which she is too large to fit. She also notices a bottle marked “Drink Me” and a box of “Eat Me”, “Try Me”, and “Take One” cookies on a nearby table, which all have a bizarre effect on her. Alice eventually finds the White Rabbit in his house, but before she can ask what he is late for, she is sent to fetch some gloves after being mistaken for his housemaid. However She eats a cookie and grows into a giant again, getting stuck in the rabbit’s house. She tries to pull herself out, but is too big. The White Rabbit, the Dodo, and chimney sweep Bill the Lizard believe Alice to be a monster and plot to burn the house down. Alice escapes by eating a carrot and shrinking down to the size of an insect. She meets and sings with some talking flowers, but they chase her away upon accusing her of being a weed. Alice is then instructed by the hookah-smoking Caterpillar to eat a part of his mushroom grow back to her original size. Alice decides to keep the remaining pieces of the mushroom on hand. Alice meets the Cheshire Cat who advises her to visit the Mad Hatter, March Hare and the Dormouse, who are hosting a mad tea party and celebrate Alice’s “unbirthday”, a day where it is not her birthday. The White Rabbit appears, but the Mad Hatter and the March Hare destroy his pocketwatch and throw him out of the party. Alice soon gets tired of the Mad Hatters’ rudeness and wackiness, Alice abandons her pursuit of the White Rabbit and decides to go home, but gets lost in the Tulgey Wood until The Cheshire Cat appears and leads Alice into a giant hedge maze ruled by the tyrannical Queen of Hearts and her smaller husband, the King of Hearts. The Queen is rather bad tempered and orders the beheading of anyone who enrages her. The Queen of Hearts then invites Alice in a bizarre croquet match using flamingoes and hedgehogs as the equipment. The Cheshire Cat appears again and pulls a trick on the Queen which she accuses Alice of doing, and Alice is put on trial. The knave of Hearts is also on trial for stealing Jam Tarts from the Queen of Hearts. Just then, she remembers that she still has the remains of the Caterpillar’s mushroom. She eats it and grows to an enormous height which the King claims is forbidden in court. Now a gigantic size, Alice feels free to speak her mind and in doing so she openly insults the Queen. However, because she had hastily eaten both sides of the mushroom she shrinks back to her normal size and is forced to flee after the Queen orders her execution and she is pursued by most of Wonderland’s characters including the Queen’s Playing Card Guards. On 12 July 1962 the band played their first gig at the Marquee Club billed as “The Rollin’ Stones”.The line-up was Jagger, Richards and Jones, along with Stewart on piano, and Taylor on bass. Bassist Bill Wyman joined in December 1962 and drummer Charlie Watts the following January 1963 to form the band’s long-standing rhythm section. Due to Decca Records’ regret at not signing The Beatles, the Rolling Stones were promoted as the opposites of The Beatles by having the band pose unsmiling on the cover of the first UK album, and by planting provocative headlines in the press such as “Would you let your daughter marry a Rolling Stone? Their first single, was a cover of Chuck Berry’s “Come On” and their second sigle, was the Lennon–McCartney-penned number “I Wanna Be Your Man”; it reached No.12 in the UK charts. Their third single, Buddy Holly’s “Not Fade Away”, was released in February 1964.Many songs on the band’s first album The Rolling Stones, were primarily covers, the only exeption being the Jagger/Richards original – “Tell Me (You’re Coming Back)”. The band’s second UK LP – The Rolling Stones No. 2, charted at number 1 as an album, and the US version, released in February as The Rolling Stones, Now!, reached number 5, The first Jagger/Richards composition to reach number 1 on the UK singles charts was “The Last Time”, Their first international number-1 hit was “(I Can’t Get No) Satisfaction” and Their second international number-1 single, “Get Off of My Cloud” was released in the autumn of 1965. The third album “Aftermath” was released in 1966, and was the first Rolling Stones album to be composed entirely of Jagger/Richards songs, and Jones’ contributions expanded To the Middle Eastern-influenced “Paint It Black”, the ballad “Lady Jane” and “Under My Thumb”. Aftermath was also notable for the almost 12-minute long “Goin’ Home”, the first extended jam on a top-selling rock & roll album. The Stones’ success on the British and American singles charts peaked during 1966 and the single “Have You Seen Your Mother, Baby, Standing In The Shadow?” featured brass horns, and had the group satirically dressed in drag, the song was accompanied by one of the first purpose-made promotional film clips (music videos). January 1967 saw the release of “Between the Buttons”, which included the double A-side single “Let’s Spend the Night Together” and “Ruby Tuesday”,December 1967 also saw the release of Their Satanic Majesties Request, which was released shortly after The Beatles’ Sgt. Pepper’s Lonely Hearts Club Band and was the first album the Rolling Stones produced on their own. The band spent the first few months of 1968 working on material for their next album. Those sessions resulted in the song “Jumpin’ Jack Flash”, and the subsequent album, Beggars Banquet an eclectic mix of country and blues-inspired tunes,featuring the singles “Street Fighting Man” and “Sympathy for the Devil, and was well received. Sadly though Brian Jones was increasingly troubled and was only sporadically contributing to the band, and left in June 1969. The Stones next album Let It Bleed featured the song “Gimmie Shelter”(which would later be described by journalist Greil Marcus as “the greatest ever rock and roll recording, Other tracks include “You Can’t Always Get What You Want” “Midnight Rambler” and “Love in Vain”. The Stones next album Sticky Fingers, released in March 1971, was the band’s first album on their own label,and featured an elaborate cover design by Andy Warhol, and contains the hits, “Brown Sugar”, and “Wild Horses”. This years Severn Valley Railway Classic Car Day takes place 26 July 2015. This year there are displays of Iconic vehicles at each station with an emphasis on certain models at each location. 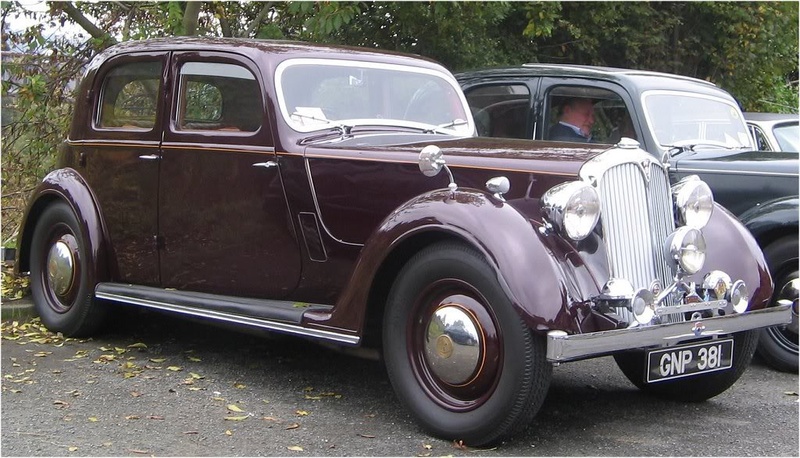 At Kidderminster Station there is a 1926 Cluley, a 1926 Rolls-Royce and an 1979 Austin Maxi on display alongside an array of many other 1960s classics. 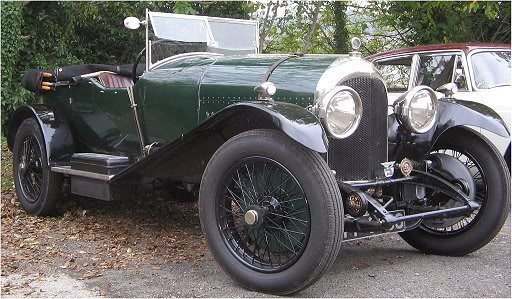 Arley Station features 1920s Austins, Bentley & Rolls-Royce Classics plus many more. At Highley Station there are 15 vehicles at the Engine House including a rare 1934 Hillman Aero and a 1920s Austin Seven Tourer. Meanwhile At Bridgnorth station there is a 1959 Heinkel Bubble Car plus many more vehicles at each station including An MG TA, Daimler Dart, Jaguar XK150, Morris Minor Police Car, Austin Burnham, a Rover 10, Ford Consul, Riley RME, Triumph Mayflower, Alvis TE21, Triumph Roadster, Vauxhall Cresta, Austin 7, MG TA, Morgan 4/4, Jaguar S type, Wolsley 12/48, Morris Minor Traveller, Land Rover, Hillman Minx, Ford Capri, Lotus Elise, Austin A35, Ford Zephyr Zodiac, MG Magnette, Austin Cambridge, Daimler Dart, Jensen Interceptor, Austin Healey Sprite, Rover 10, Rolls Royce and a Jaguar XK120.